If you've been rafting before and loved it, then this beginner's Ganga rafting expedition is perfect for you! You'll spend three thrilling days rafting down the Ganges, and each night, you'll camp out under the stars, ending the day beside a bonfire. On your first day, you'll be driven to your first camp, where you'll spend time getting used to your raft, equipment and the river. You'll warm up on some easy rapids, meet the rest of your team of travellers, and enjoy the rest of the day swimming and body-surfing. For the next two days, you'll be rafting about 30 kms on grade 3 and grade 3+ rapids like Three Blind Mice (3+), Cross Fire (3), Roller Coaster (3+), Golf Course (3+) and Clubhouse (3). NOTE: Each day involves about 4-5 hours of rafting, so you should be prepared for this. What happens to your luggage? Anything not needed for the trip can be safely stored in Rishikesh at the supplier's office. Pack light, only taking what you need, into a soft backpack for your three days on the river. This will be carried in dry bags on a kayak, and will be handed to you at each campsite. IMPORTANT: This Rishikesh rafting trip is not a fixed departure trip. It requires a minimum of 6 travellers for a booking confirmation. Surrounded by the Himalayan ranges, Rishikesh is a small town that offers spectacular views of jungle-clad hills. It is also the place where the Ganga and Chandrabhaga meet. You'll begin the Ganga rafting expedition from Devprayag, where two rivers meet to form the Ganga. This is a long stretch within a rocky gorge, so you can expect some spectacular landscape. The campsites are located on the white beaches of the river, so you'll spend all your time very close to the river. As you head towards Rishikesh, you'll battle bigger rapids, with even one Grade IV rapid close to your beach campsite! This rapid is great fun, and topples most boats, but you'll be able to swim back easily to the beach. 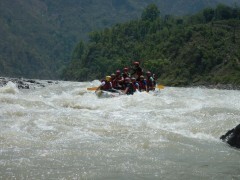 • Earn bragging rights by taking part in a Ganga rafting expedition. • Raft down the Ganges, through rocky gorges, past white beaches and beautiful scenery. • Battle through Grade III and III+ rapids. • Camp at night on riverside beaches in tents. For cancellations made more than 30 days before departure of rafting expedition in Rishikesh: 75% of the trip cost will be refunded. For cancellations made 29-15 days before departure of rafting expedition in Rishikesh: 50% of the trip cost will be refunded. For cancellations made 0-14 days before the Rishikesh rafting expedition: No refund. 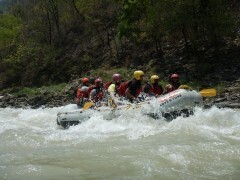 The trip cost for the rafting expedition in Rishikesh is quoted as a package. No partial refunds or credit will be given for services not used. Make sure you report by 08:00 hrs so you can begin your drive on time. It's a three-hour drive through Bagwan, so you'll get to see a lot of this region. At Devprayag, you'll meet your guides for the expedition, as well as the rest of the team. The preparation for the first day takes some time, and then you'll take your first steps into the water. Today you'll be trying out the rafts and your gear, and learning how to work together on the rapids. You'll be rafting through easy rapids that run entirely inside a gorge. The walls are rocky and tower above you, making this a dramatic first day. You'll reach the campsite soon, and then settle into tents. Enjoy the rest of the day swimming or admiring the views. Your first white sand beach on this Ganges rafting expedition. Today you'll raft for a full 30 kms down the river. This should take about 4 hours, and will take you over Grade III and III+ rapids. As you approach the end of your rafting, just near the campsite, you'll encounter a Grade IV rapid. You can expect to be tossed into the river, unless you've picked up excellent rafting skills, but you can swim to the beach from here. Once you're at camp, you'll freshen up, and can chill on the beach or paddle in the river while the sun sets. A bonfire and a hot dinner are the perfect end to this day. Overnight in tents. Enjoying a paddle after the rafting. Today's the last day, and you'll be entering Rishikesh. Here you'll encounter some of the most famous rapids on the river, such as Three Blind Mice, Crossfire, the Body Surfing Rapid, Roller Coaster and Golf Course. 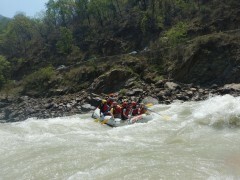 This section of the Ganga rafting expedition is the most fun, and will challenge your rafting techniques. At the end, you'll jump into the river for some fun. After this, you'll be served lunch, and can hang out with your team mates as you swap stories. The trip ends after this. Tonight you'll camp at a riverside campsite, in twin-sharing tents. You'll arrive early at the campsite, and will have time to take a dip in the river, swim a little, and try body surfing. This is a great campsite for nature lovers, because there are birds and wildlife to be spotted. You will have access to dry pit toilet tent during your expedition/camping. Sleep under the starry skies, with comfy sleeping bags and tents. After a fun day of rafting, you'll reach your campsite and relax for the day. There's a bonfire at night, and then you'll retire to your tents for a good night's sleep. You will have access to dry pit toilet tent during your expedition/camping. Dig into a big breakfast before setting off on the river again. Today you'll raft the most popular stretch of the river, tackling iconic rapids and bringing your raft in safely to Rishikesh. After lunch, your trip ends, leaving you free to proceed to your next destination. You will have access to dry pit toilet tent during your expedition/camping.